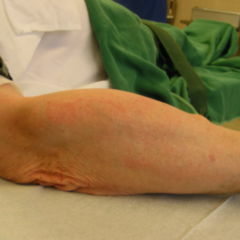 An intramuscular injection is defined as the injection into a muscle, eg. the gluteus medius muscle or the deltoid muscle. As opposed to old doctrines, the gluteus maximus muscle should not be punctured due to the risk of injury for the sciatic nerve passing below. Independent of the chosen technique, before the injection, you always should apply an aspiration. For this, the syringe plunger is drawn back shortly in order to make sure that the cannula did not hit a blood vessel. 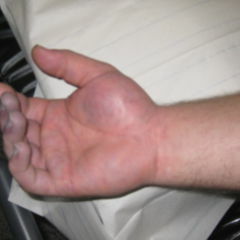 This could lead to a fast uptake of the active substance or to the formation of hematomas in the muscle. Intramuscular thigh injection according to Hochstetter. It is considered the safest method of i.m. injection, for an injury of the sciatic nerve is highly improbable. An alternative to the techniques described above can be found in the intramuscular injection into the deltoid muscle, which usually is performed on the sitting or standing (attention!) patient. The site of injection is the main mass of the deltoid muscle. The injection needle is pierced into the muscle vertically to the skin surface around three finger widths below the acromion. Due to the low muscle mass, the intramuscular injection into the deltoid muscle is only apt for small injection volumes (< 2 ml), eg. for vaccinations. The choice of the length of the cannula depends on the injection site chosen. You can use cannulas between 25 and 70 mm of length. A too short cannula - especially in obese patients - can lead to a wrongly administered injection into the subcutaneous adipose tissue, which changes the active substance uptake and can cause atrophy of the adipose tissue. When you pierce too deeply with a too long cannula, the tip of the cannula can deform due to bone contact, which leads to unnecessary tissue tears in the puncture channel when pulling back the cannula. Furthermore, repeated injections can lead to a muscular fibrosis and/or calcifications in the muscles or adipose tissue. Acute myocardial infarction: The intramuscular injection leads to the release of muscle-specific enzymes which complicate the laboratory diagnostics of myocardial infarction. The intramuscular injection is a medical action which can be delegated by the physician to qualified healthcare personnel (nurses) upon previous validation of their respective expertise. The person performing the injection bears the responsibility for the competent performance (implementation responsibility).